For fast, accurate distances to greens, hazards and doglegs, turn to the Callaway GPSy sport watch! The scorekeeper tracks your scores, GIR, and putts per round, while the auto-course recognition feature locates your course and will advance from hole to hole during play. The GPSy also comes preloaded with over 30,000 global courses and requires no download or subscription fees. 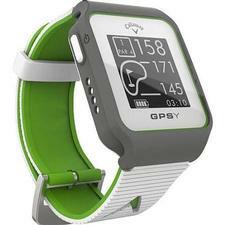 If you have any more questions about the Callaway Golf GPSY Sport Watch (White And Lime); do not see the model you are looking for; need custom options; or prefer to not purchase online, then please call us at (630) 656-1291.